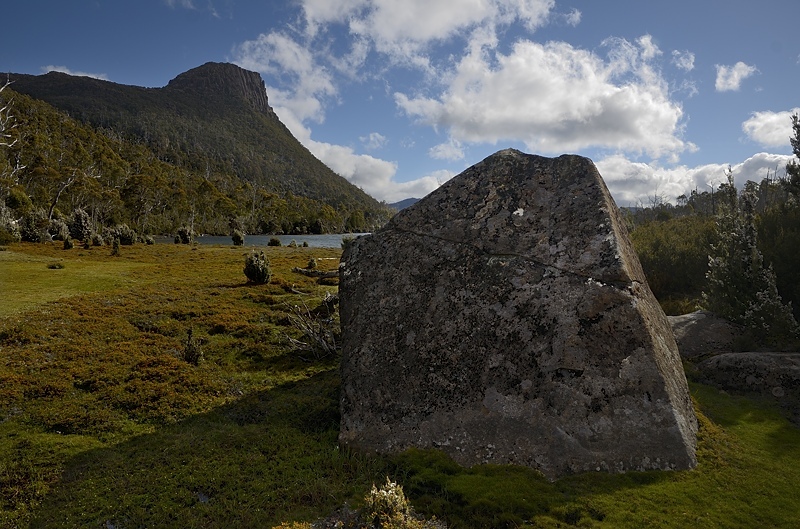 Mark's Tasmanian Bush Blog: Lake Myrtle, Mount Rogoona and Junction Lake - 12th and 13th January 2013. Lake Myrtle, Mount Rogoona and Junction Lake - 12th and 13th January 2013. 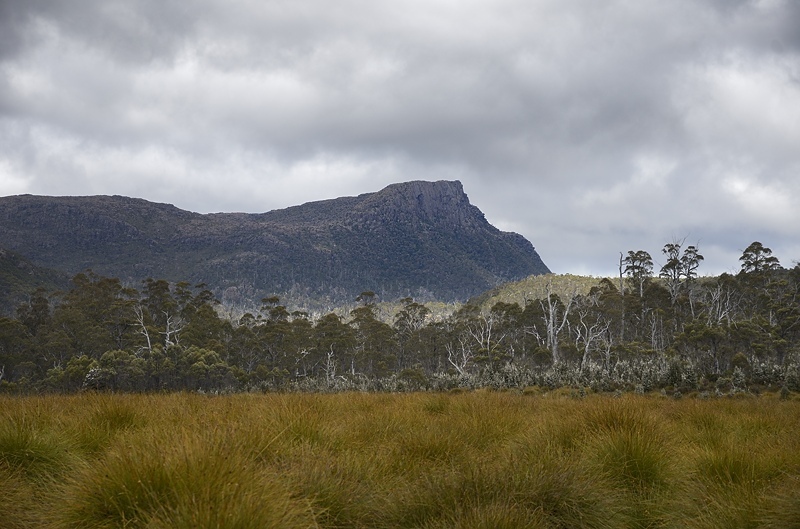 I specifically wanted to be able to walk through the Never-Never and return via the Overland Track without having to use two cars or other forms of transport. This seems to be most easily achieved by commencing a walk up the Lake Myrtle Track and returning via Lees Paddocks, giving a road walk of only 2.5km at one end of the walk. 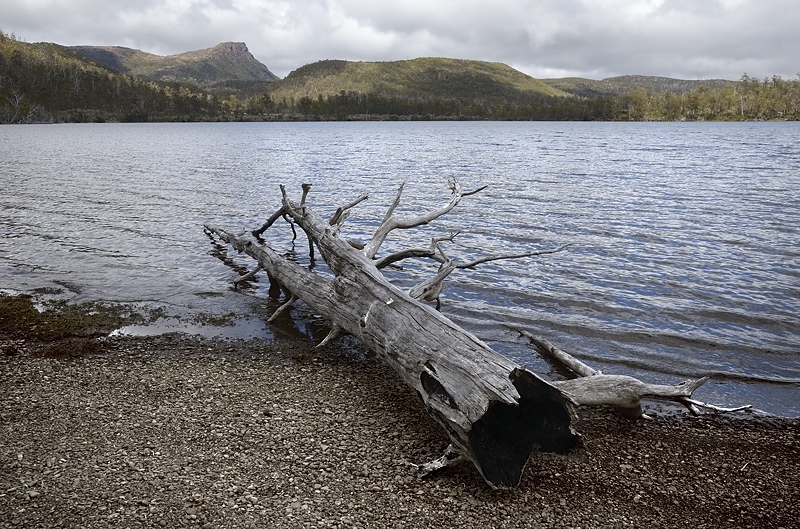 The Lake Myrtle Track is shown on the Cathedral 1:25,000 mapsheet, and is described in Chapman's Cradle Mountain Lake St Clair book. The carpark is 200m past Juno Creek, 7km from the turnoff for the Walls of Jerusalem. There is parking for maybe 5 or 6 cars, depending on how well it is done. The track climbs steeply onto the plateau through forest, emerging on button grass covered Blizzard Plain across which the track is followed to Lake Bill, with views to Mount Rogoona. This lake has a little gravel beach, and a short sidetrack takes you down to the shore. The Lake Myrtle Track continues around the eastern side of the lake, climbing the hill a way in dry forest, before descending and crossing Jacksons Creek which flows out of Lake Myrtle. A relatively gentle climb near the creek to Lake Myrtle ensues, where good campsites are found on the grassy plain north east of the lake. Mount Rogoona makes an impressive sight from here. 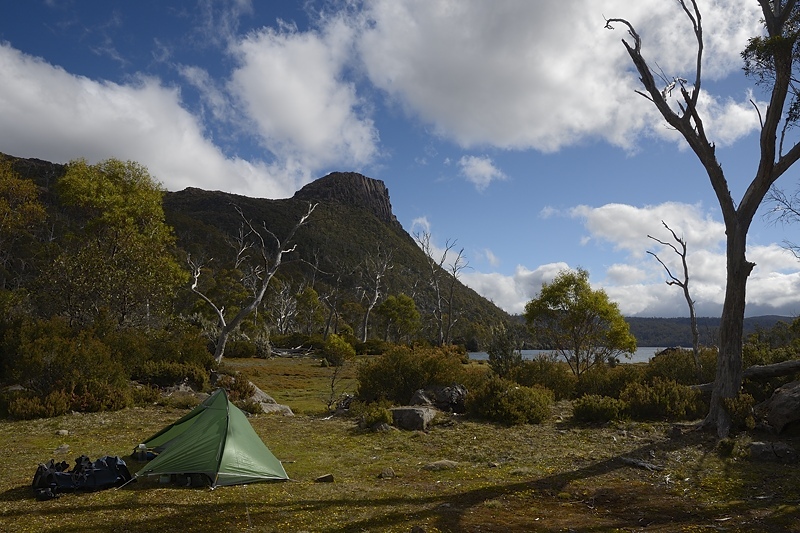 I camped here for the night, and went on to Mount Rogoona and Junction Lake the next day. 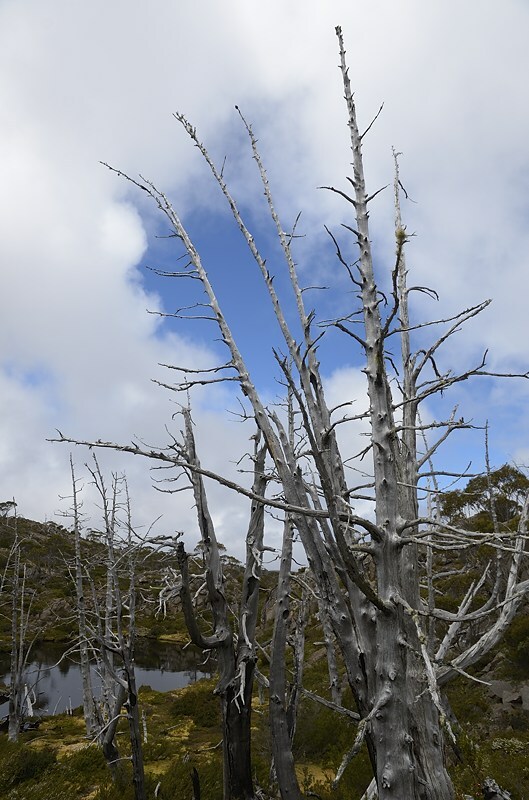 The lake surrounds have been devastated by fire in the past, and the skeletons of pines and eucalypts are very obvious. 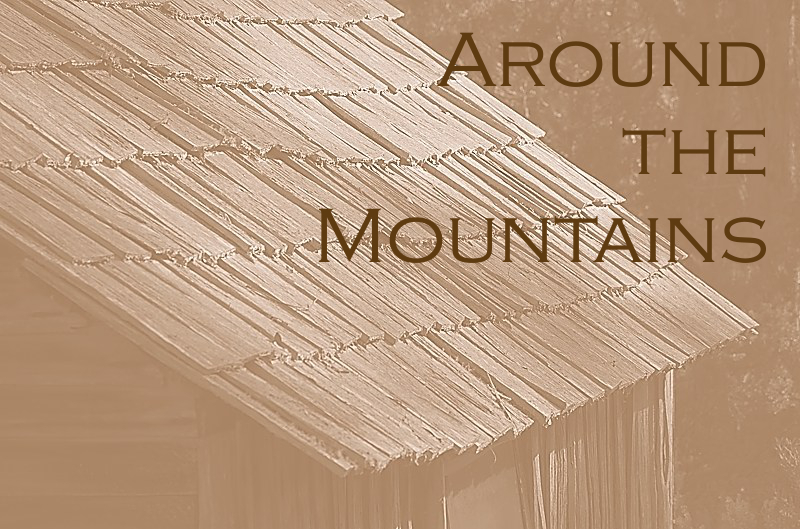 The track climbs to a saddle on the northeast of Mount Rogoona, where the mountain can be climbed as a sidetrip. The point is obvious - it's where the track starts to descend again. I'm not sure how to describe this off-track walk, as there are cairns that can be followed from both ends. They don't meet up, and neither cairned route appears to follow either the paths recommended in guidebooks, nor the easiest line. As a result I had an interesting meander across this plateau. There are also two noticeable descents into valleys on the way. Can I suggest that you read both Chapman and Volume 1 of the Abels, and find your own way there. I was adequately furnished with directions, map, compass and GPS, but I can see the possibility for the directionally-challenged to head down the wrong hills if they were to find themselves on the plateau in cloud. I would suggest you not even bother with this mountain if it's cloudy. One strategy is to put the coordinates for the summit (obtained from the Cathedral 1:25,000 map) into your GPS and use the Go-To feature. What you will find is that the cairn on the actual summit is visible from some distance, eventually giving you something clear to aim for. I got moderate views, and they were actually very useful for me in starting to make sense of the topography of this area I haven't walked in before. There is a great view down onto Lake Myrtle, which I have provided above as a four-shot panorama. The mountain has been burnt in the past, and the little tarn has a display of pine skeletons as a result. Returning to the track, there is a short steep descent to Lake Meston and the hut there. This hut is similar to the one at Junction Lake. They are both quite rustic, but provide welcome shelter in poor weather. Neither is very animal-proof. Beyond the hut, the track undulates a little to pass along the lake and onwards to Junction Lake. The track does become less distinct, and I have to admit I followed a wrong track at some point nearing Junction Lake, necessitating a short off-track excursion to bring myself correctly to the hut. Here I met three senior lady members of the Warrnambool walking club who had been on an off-track extravaganza, in the rain, across Chinamans Plains, through the Ling Roth Lakes, up onto the Mountains of Jupiter and finally back down to Junction Lake via Lake Artemis. They were slightly crazed, but were off to Chalice Lake the next day to visit the Cathedral Mountain environs. I will be watching their website for their trip report. Meeting them was very useful, as I obtained some intelligence on the following day's walk to Lake Artemis and the Mountains of Jupiter.